Bet Knesset Ohel Ari, situated in the northeast of Raanana, Israel, is a young, vibrant shul numbering approximately 250 families. What began as a small minyan (HaMinyan Hechadash) praying together on Shabbatot, Hagim and Yamim Noraim in local schools, has over the years grown into a warm, welcoming community. Not only has our membership grown tremendously, but it now includes Olim & Vatikim from Israel, Australia, Canada, England, France, Belgium, South Africa, Switzerland, and the United States. With the assistance of the City of Raanana, we were able to secure a plot of land situated on the corner of Ravutsky and Tzipman Streets -- and we recently moved into our new premises, our mishkan katan. We are proud of the minyanim that take place in our new facilities on the corner of Ravutsky and Tzipman Streets , every Shabbat and Hag. In addition, we run a wide variety of youth and Chesed programs throughout the year. In 2004, the Amuta decided to embark on the challenge of securing and building a permanent home for our community. 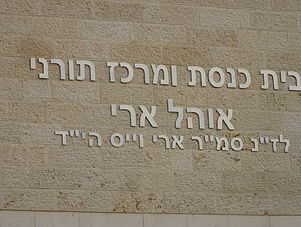 In 2006, the Amuta decided to change the name of the minyan from "Haminyan Hechadash" to "Beit Knesset Ohel Ari," in memory of IDF Sgt. Ari Weiss H"YD, the son of Rabbi Stewart and Susie Weiss, who fell in battle in 2002 against Hamas terrorists. The Amuta felt that changing the name to Ohel Ari was both a privilege and an honor, and along with the Weiss family we are looking forward to ensuring that the facility will thrive as an important center for prayer and Torah study.